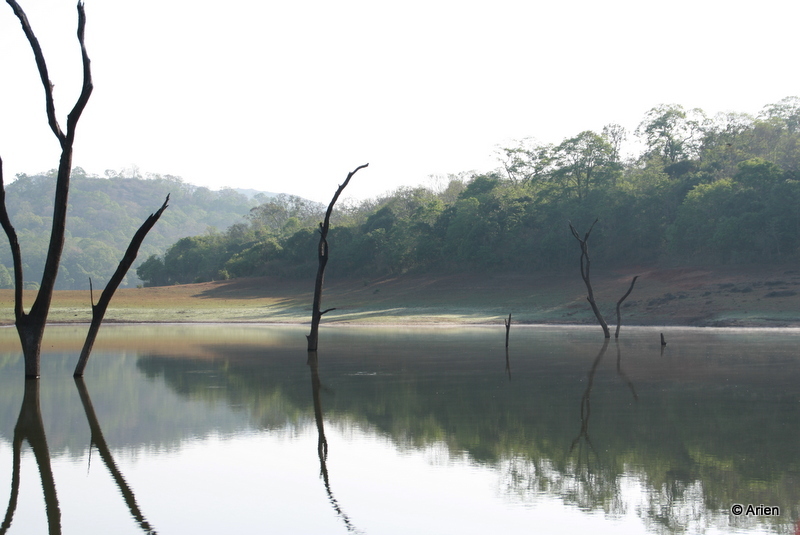 The boat safari is one of the most popular activities at the Periyar Reserve. And 5 years ago, I recall we had gone on the safari on a beeg boat. At noon, if I am not wrong. This trip, we were outside the Reserve at 5:45 am because the guide had informed us tht the ticket counter opened at 6 am and we may not get any tickets if we were late. It was a cooold day and both of us stood, shivering, outside the counter till after 6:15 am because no one turned up to issue the tickets. I was cold and the Arien was bored and we headed back to our car so we could at least be warm. The Arien also decided to have Chai. It was after 6:45 am when we were armed with our tickets. We then drove into the reserve to park the car. The Yeah 🙂 look on our faces soon changed to the bewildered :O look when we saw the other tourists run from the entrance to the other counter that sold us our boat tickets (a distance of more than 2 km). Everyone ran as if their life depended on tht ticket or boat ride. We did not understand what the fuss was all ’bout considering we all had tickets and so we sauntered in. Well, one learnt why very quickly. Apparently, the first ticket hardly matters! Yes, I am right. The second ticket is the one that gets you a boat. So, how fast you run to the counter, fill in details, and get your ticket and are assigned the boat, determines when you will get to go on the safari. We waited a loong looong time and I vented, ranted, and cribbed. A lot. Made no difference. Another point to note, they collect data such as your home address and contact number etc for every tourist who travels on the boat safari. This is something new. (We did not provide these details 5 years ago). I think it is because of the periyar tragedy where the boat capsized and most of the folks died. Identification must have been tough because most of the folks were tourists. Again, this was not something I knew – I was cribbing and it was the Arien who informed me. The mood improved slightly when we finally got onto the boat. The Arien got busy taking photographs, some of which came out ok while others were slightly blurry. In the last trip (5 years ago), we hardly saw any animals. 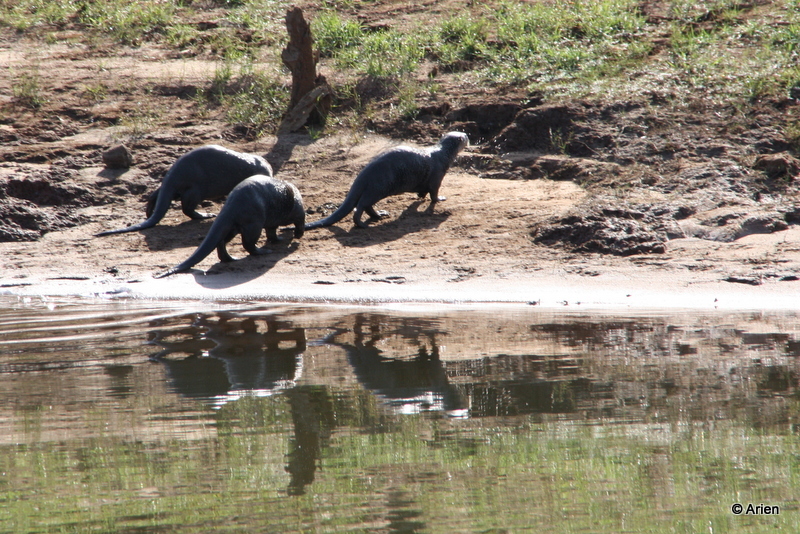 This time, we saw elephants, a lot of birds, the popular cormorand, and a couple of otters. It was quite cold in the morning but now the sun was up and we really longed for a cup of chai or something – it has been hours since we left the resort. People were clicking pics left, right, and center. The Arien cribs ’bout the snaps that he has taken everytime and that happened this time as well. While it was not a fantabulous trip, it was ok. To be honest, I would not advise anyone to go on that safari until the process i mproves or changes. We had planned to go on that safari more than once during this trip but dropped the idea after this one experience. I think more effort should be put in to streamline the process and make it more customer-friendly. This experience left me feeling cheated. We were there early and the Arien dashed off to have a cuppa chai and bajjis from a roadside shop. I was hopping mad but he came back with a cuppa for me and my anger disappeared 🙂 We went in – we were the first ones. The first thing we noticed was that the seats were all around, above a square shaped enclosure. We would be watching the performance from above. Usually a performer is on a dias – this is the first time the audience was above. The Arien commented on the darkened section of the left-side of the wall. People walked in and the show began. 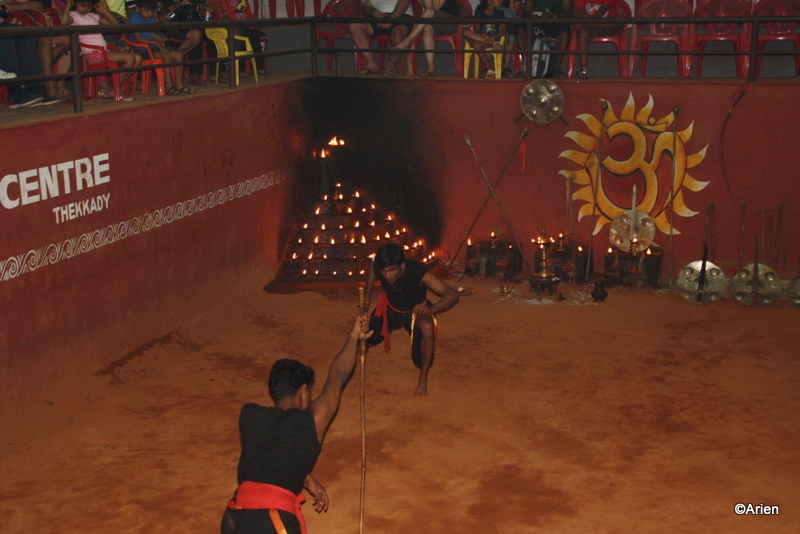 The performers entered one-by-one and lit the lamps all around. The left-side of the wall – was suddenly aglow with the lights of a hazaar oil lamps. It looked beautiful. After all the lamps were lit, the performers paid their respects to the lamps (guruthara) and then started the performance. 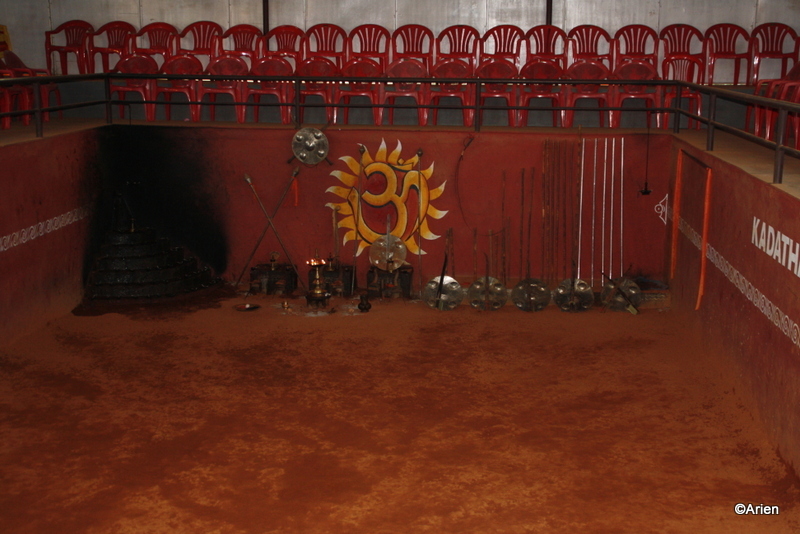 The performers used all the instruments laid out. 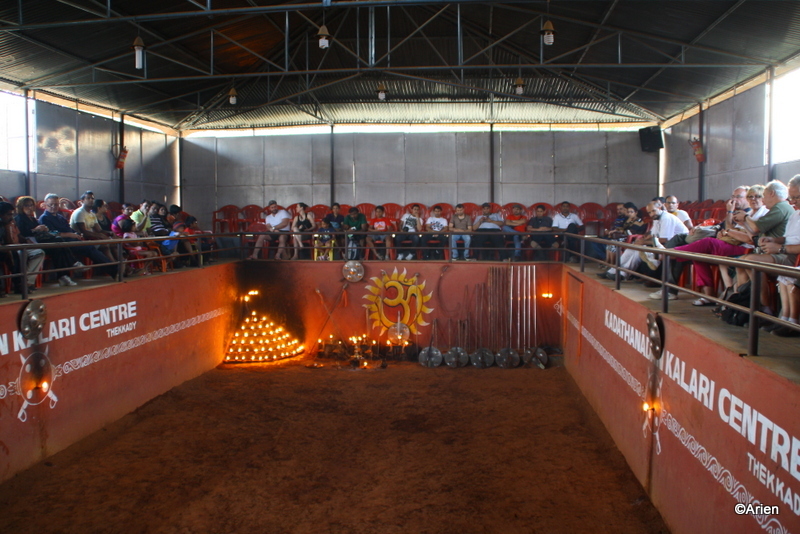 The performance, the sound of the drums, the smell of the oil lamps, everything served to keep you totally engrossed. Some of the photos appear flat as if the performer is standing with the bar – but he is actually twirling it and the photos are unable to match their speed and dexerity. It was beautiful! I was quite aghast to see the snaps 😦 The performers completed their performance, bowed and left. Other performers followed suit with their performance and so on and so forth. Some of the initial performances were more of a play of hands. 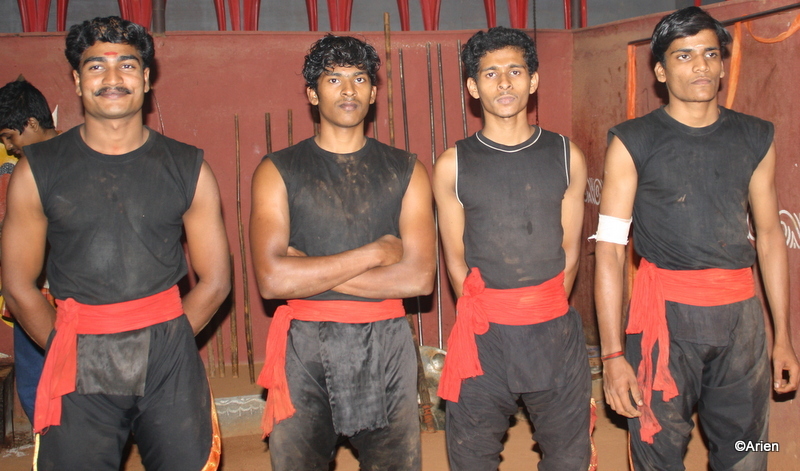 This was followed by a performance which showcased self-defence tactics. It showed one how you can save yourself from a guy with a knife, with just a cloth, very similar in size to a regular duppatta. One performer would play the part of the victim and the other would be the villain with a knife or a stick. 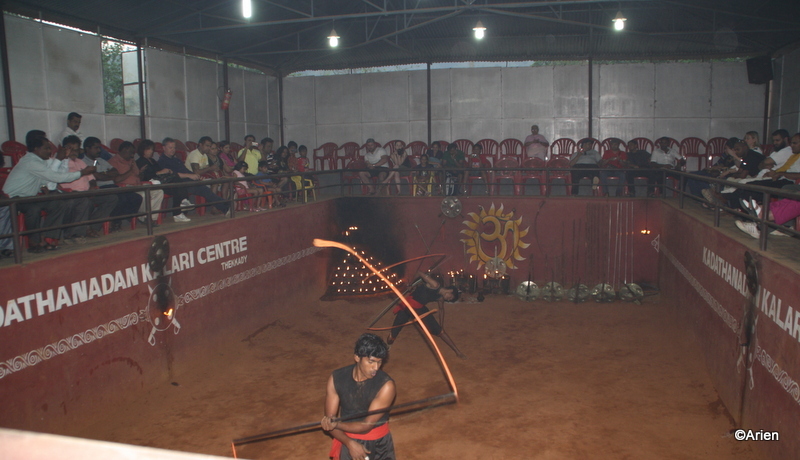 The performance showcased that you could handle the villain with ease as long as you are quick and nimble on your feet. The whole performance had a rehearsed-feel to it but was well-done. There was another performance where the performer was able to do a ChakraAsana (bending over backwards till his head touched the floor) and pick up a flower from the ground. There was a loud burst of applause and an OhmyGod! (I realized I had said it aloud when I noticed the Arien stare at me). The performances required a very different level of fitness and a flexibility that would only come after years of yoga. 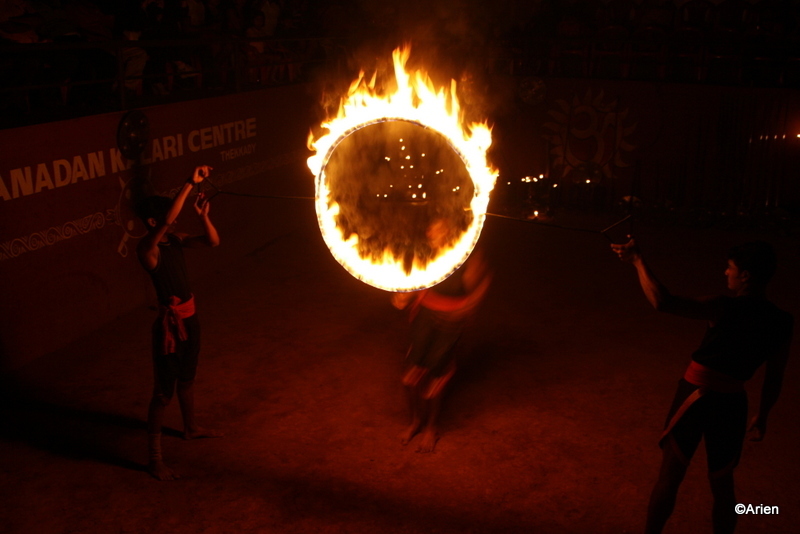 There were two performances that were probably the highlight of the entire program and that was the use of fire. 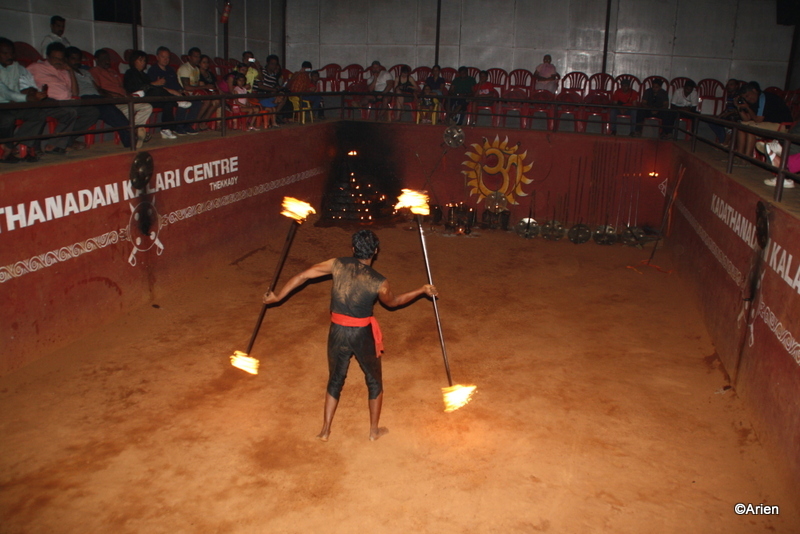 The first performance involved twirling those steel bars whose ends were on fire. From the distance, we could smell the fire – it is quite a feat to twirl those bars and the performer did a fantastic job of it. There were a few yells and lots of claps after this performance as well. I noticed that some of the older foreigners had left in between. I had been so engrossed that I did not notice them leave at all. The second performance was similar to a circus performance. In a circus, they would make the lion or tiger jump through a ring of fire. 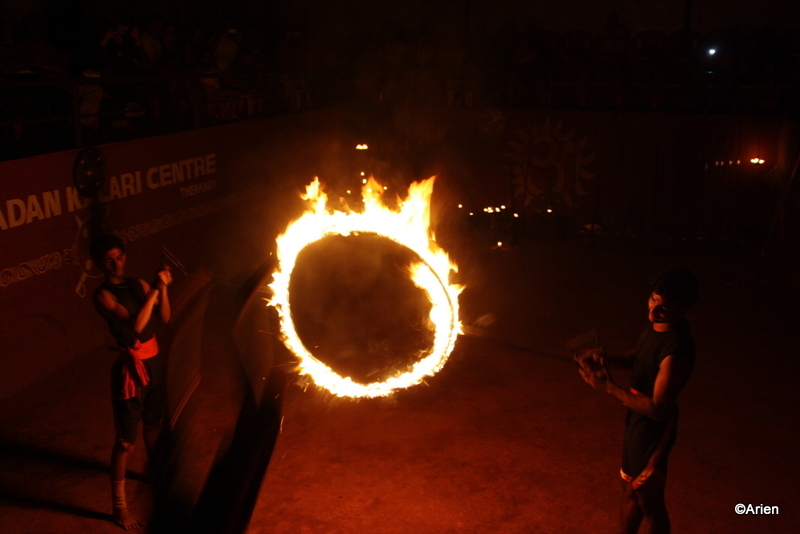 In this performance, two performers will hold two rings of fire while the third performer would jump through it. It looked scary and impossible – plus the heat generated would make anyone think twice. After a seemingly easy jump, the third performer swiftly jumped through the ring of fire. The snaps for this performance are a lil blurred – thanks to the swift jump. The other two performers appear quite ok, as you can see. As you can see, the light was not too conducive for photographs because it was dusk. Also, the movements of the performers were so quick that some of the pictures appeared blurred or failed to capture the beauty of the performance. The entire performance was totally worth our while. I only wish they had had better lighting. Good photographs go a long way in helping the performers get aid. After the performance, the performers willingly posed for pictures with the audience. They also allowed the audience to use their bar, shield for their personal snaps. 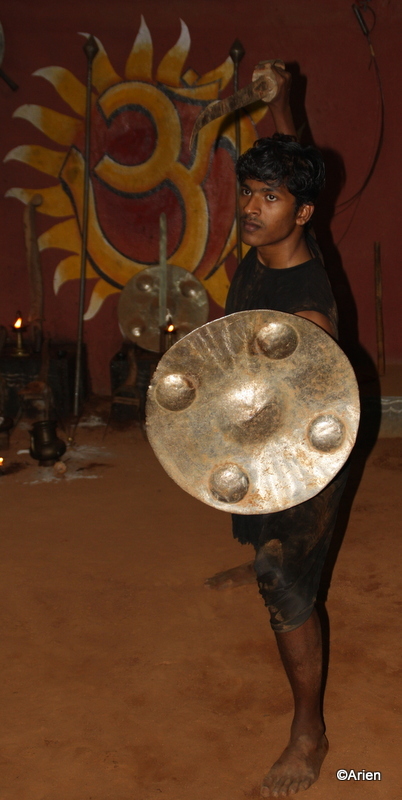 The Arien did not feel like holding the shield or the bar and did not want a picture of himself. He took this picture of one of the performers. He also took a picture of all the four performers together. We had the Kathakali performance to get to and there were a few people who wanted to do the routine toursity snap stuff and so we left immediately. I did not want to miss the second half of the evening entertainment for anything. We woke up a lil late on the next day thanks to the all-day driving yesterday. So I was quite surprised that we were able to get going at 9 am. We stopped at a small eatery for breakfast. The Arien had a heavy breakfast comprising of “barota” and fish curry. The masala dosa I ordered was so spicy, I had tears in my eyes. We were now ready to visit the Periyar Tiger Reserve. We drove to the entrance and were stopped by two “guides” who informed us that we will probably see no animals during the boat ride taken at this time. He advised us to come the next day at 5:30 am so we could go on the 6 am boat ride. So the plan for the day was effectively cancelled. While we pondered over what to do today, I recalled that I had seen some information about a church and asked them ’bout it. Nobody knew ’bout the church. 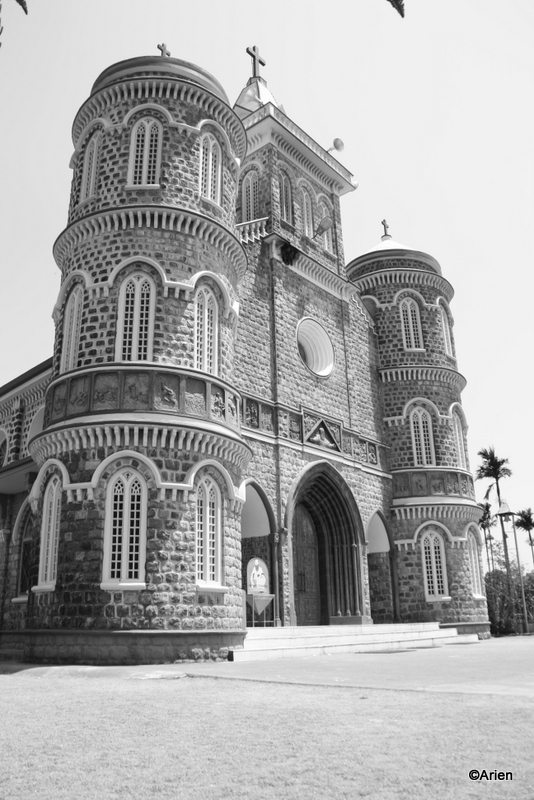 The information I had was that this church was like the Velankanni church. Most ppl told me it was in Tamil Nadu – Duh!! 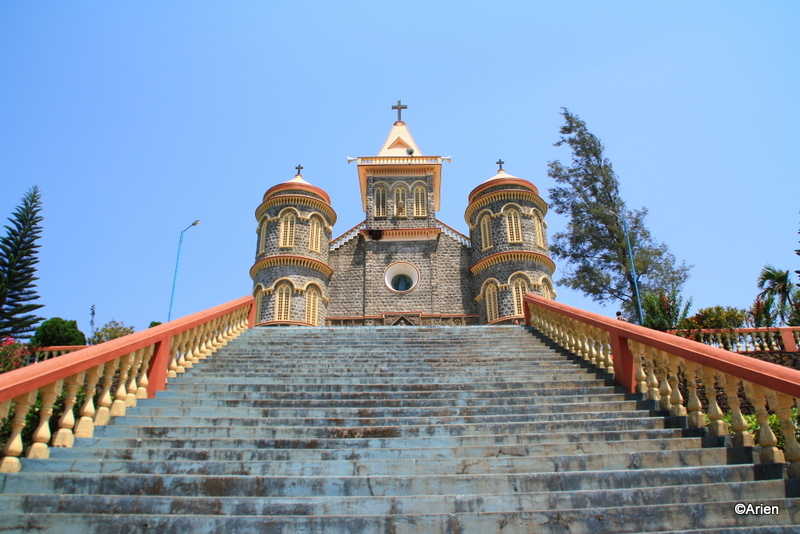 Finally, one guide mentioned that I was probably asking ’bout the “Pattumala” church and offered his services as a guide for half a day. Both of us were not so sure ’bout this but decided to go with the flow. The guide jumped in and guided us to the church. The route was scenic and though it was a sunny day – the breeze was cool. Behind us the guide chattered on and on and on. 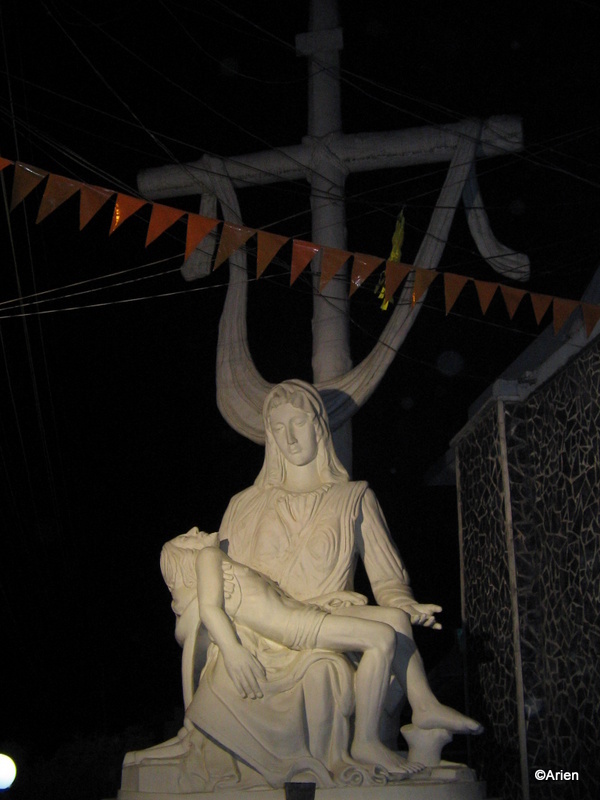 It was the first time we had started our holiday on a religious note. Both of us were surprised. The church was peaceful and there were a handful of folks inside and both of us felt relaxed. When we came out, we were met with the incessant, meaningless chatter from the guide. The Arien escaped to shoot the church from different angles, lighting etc. I was stuck with the job of nodding my head politely whenever there was a pause. The Arien came back when he was done with his shots – he managed a few black-n-white pics which looked very nice. It was only when we looked up that we noticed the ugly stain in the front of the church. It looked like there had been a bee-hive which had been burnt a while ago. We finally left the church. 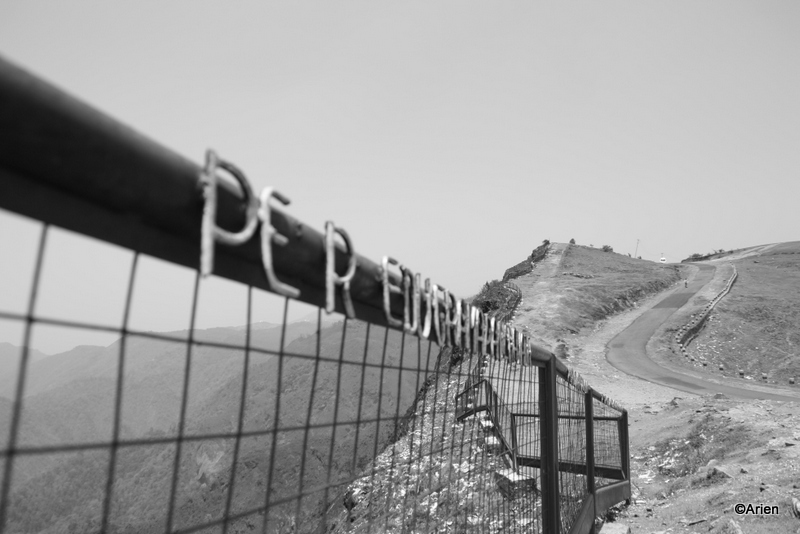 While we contemplated returning to the hotel for lunch, the guide mentioned Paranthumpara. Paranthumpara in malayalam meant eagle (paranthu) rock (para). 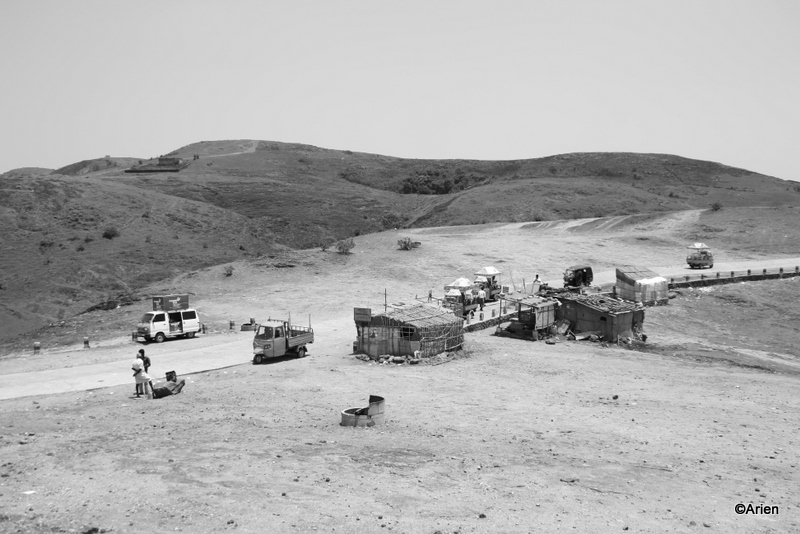 When we reached the place, it felt like we had reached the end of it all. The guide mentioned that the place gets crowded during the sabarimala season as the “makarajyothi” can be seen from here. It was beautiful and cool inspite of the hot sun. The Arien took a few more black & white pics. 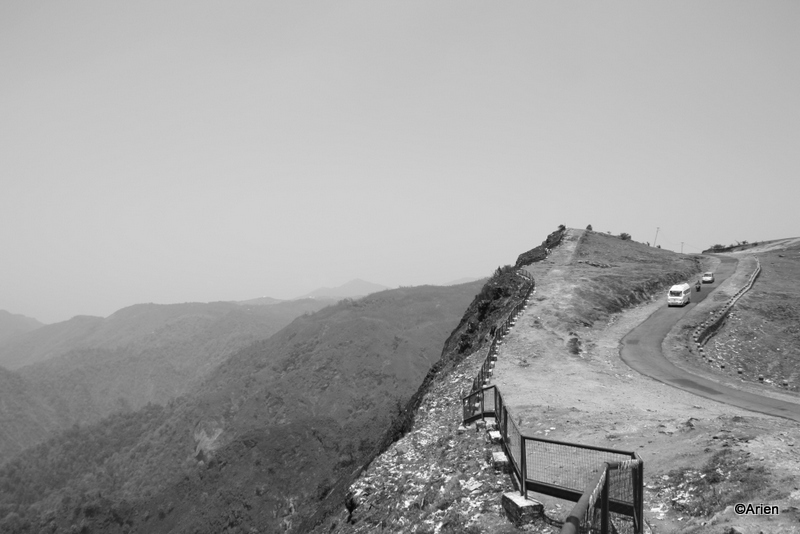 I was reminded of a similar place in Lonavla when we visited Mumbai. An old man selling kadalai walked up to us. The Arien immediately purchased two, one for us and one for our guide. The guide was initially zapped tht we were buying from the local vendor and then happy that he had one packet for himself. For a few minutes, the guide did not blade us 🙂 As you can see the Arien’s fascination with black and white snaps, he took a few more. We returned the way we came and drove by a nursery. 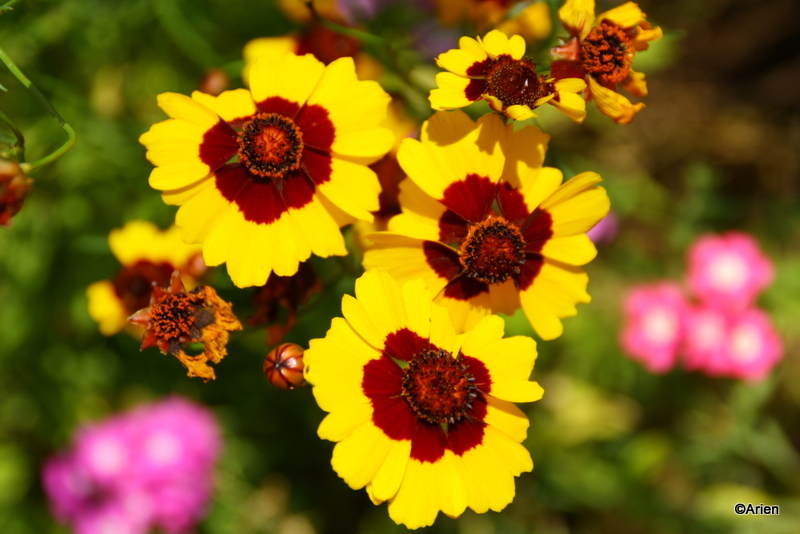 I think the bright colours of the flowers in bloom attracted the Arien as we drove by. He went a bit crazy and shot a few dozen pics at the nursery. I was forced to listen to more stories from the guide as we waited for the Arien to focus on the owner of the nursery who was trying to sell us seeds of the various flowers that the Arien was so intently shooting. We finally purchased a few seeds and left. The second colourful snap of this blog post 🙂 The guide took us to an elephant camp as well but the lady refused us permission to shoot snaps unless we took an elephant ride. Both of us did not want to go on a ride and so we left. The guide had been quite useful. However, his sob-stories did not ring true. He kept talking of his poverty-striken family, the ill-health of his parents, etc. continously. We had already discussed the amount we would be paying him for the time he would be spending with us. However, he expected us to pay him more because of the sob stories that he shared. We both felt that this was his standard line – one he uses for all tourists including foreigners. The Arien refused to budge. The whole incident irritated us rather than made us feel sympathetic. Did not like this part much. We were quite tired after the loong drive and decided to have dinner at the resort itself rather than having food outside. It was a buffet and though the variety was not all that great – it was ok, a bit expensive as well. The cottage we had at the resort was huge. There was simply tooo much space and we kinda felt lost in it. We had a decent-sized hall, a kitchenette, a dining area, and a large bedroom. The resort was an eco-resort and not maintained all that well. As usual, we faced some issues. The geyser was not functional and the mini-fridge refused to work. We refused to let that spoil our holiday and planned the next day. Our first holiday in 2012 – Yeah!!! 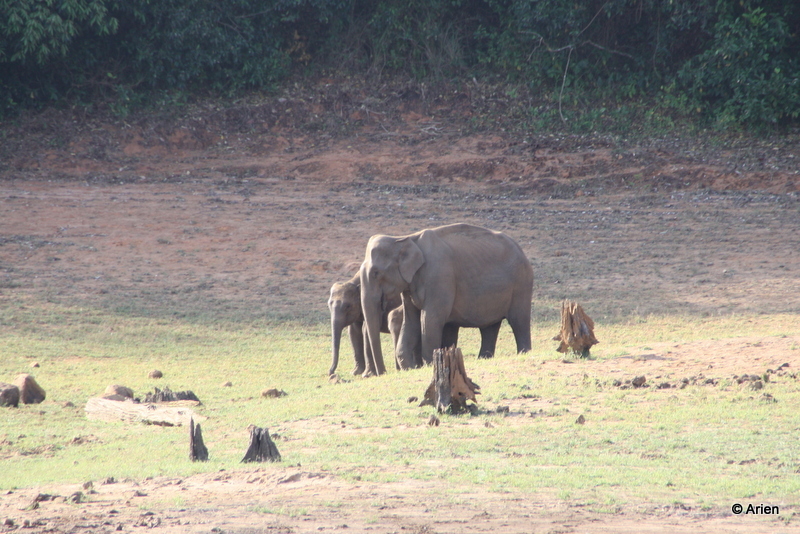 The penultimate day of our Wayanad holiday began early – we decided to visit Nagarhole National Park. We started early but got distracted as we spotted quite a few spotted deer on the way. Usually, they are frightened and shy away frm ppl. So it was indeed a beeg surprise to see them focussed only on eating – they were chomping away on the grass and cared two hoots for us. This was a double yeah!! 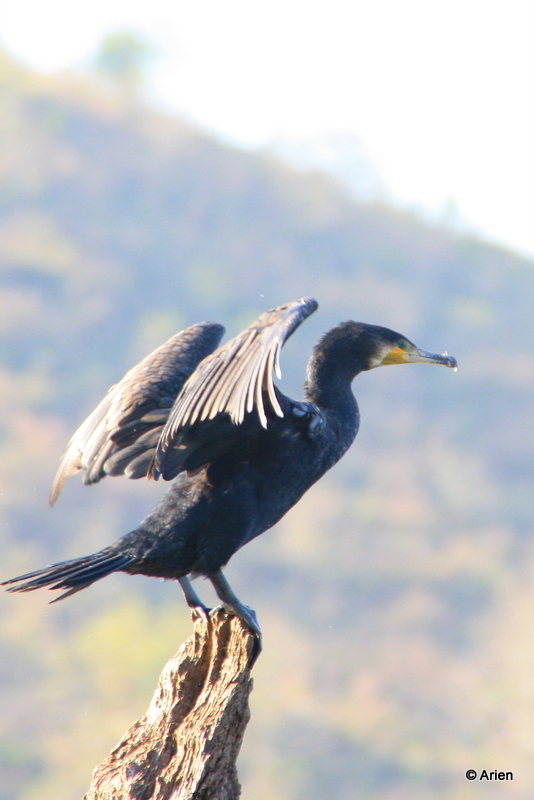 for us as it enabled us to shoot pics of them. Occassionally, a stag would look up and move the deer out of our focus area. We would then move away, only to find another bunch, a few metres ahead. We kept trying to better our shots. The Arien with the borrowed SLR, and me with our regular camera were soon so engrossed that we had totally forgotten ’bout the Nagarhole safari that we were supposed to go to. Finally, after a few more snaps, the Arien tore himself away so we cud go for the safari. When we reached, we were told that the bus had jes left and the next one was not until 8 or 8:30. We were willing to wait and so we whiled away the time, walking to and fro, chatting with the officials, shooting snaps, and getting bored! When the bus came back, we heard it before we saw it – as it was a very noisy mini-bus. The Arien decided not to go on the safari. In his words “The rickety bus will make so much noise tht no animal will be seen anywhere nearby. Forget it.” Meanwhile, we found out that the mini-bus would do a second-round only if there were at least 10 ppl in the bus – we were 6 – us and a family of 4 of which two were really small kids. We totally lost interest and decided to head back to Ramcad. Over breakfast, which was stone idli and crunchy avalakki – we discussed our plan for the day. The Arien insisted on seeing Irrupu Falls which was 1 km away. Now, I had been to Irruppu falls a while ago but cud only remember tht there was a steel bridge of green colour (I think) b’cos we had all stood over it and taken snaps. Anyway, we freshened up and drove to Irrupu Falls. When we reached there – I could not recall the temple that was the entrance to the falls – I was sure tht it was built much later. After a looong walk, I finally saw the bridge – it was blue in colour 😀 I insisted on taking a snap – I still recall how we all had posed for the earlier one – this was frm a different angle and looked neat. The trick was to take the snap when no one was arnd – tht was tough – ppl were constantly walking to and fro. Anyways, we kept walking on. The place had changed quite a bit. For instance, I could not see the place where all of us had sat and posed for one of those group snaps. Anyway, the falls by itself was not too impressive after having seen Sentinel or Soochipura falls. Of course, we had gone in May and so naturally, there was hardly any water. Still, there was enough for a lot of men with huge paunches, clad only in chaddis to have fun. The sight was honestly quite embarrassing. We managed to take this snap frm a lower location so you do not have to experience that bit of torture. The lower location was more like a half-way break for the old and the weary to rest their feet before climbing up. After Edakkal, Soochipura, we found it easier to climb past the half-way location. On our way up – we read stuff ’bout Irrupu Falls being famous for the number of butterflies tht flock there. I was not even aware of that until we saw two guys shooting pics of butterflies. Immediately, the Arien took off as well, it was really trying – trying to keep up with the Arien who was trying to shoot the butterflies. I almost gave up hope when suddenly one of them stayed pretty close to us, allowing us to shoot it. It took the Arien a few zillion shots before he got this shot. After a while, he got an amazing close-up shot. Looks like the butterfly wanted us to wait before it gave us its best shot 😀 We left Irrupu Falls soon after, the Arien was not too keen on playing in the water with the paunchy men and so we went back to Ramcad. As we drove to the resort, the Arien decided tht it wud b good if we ended the holiday immediately instead of staying for one more day as was our original plan. We went back to the cottage and started packing, and getting ready. We informed the guy who served us lunch ’bout our plan and told him to keep the bill ready. He took it pretty badly and walked off in bad grace. When the bill arrived, we had another shock – he had charged double for non-veg. We have always had this experience with Coorg. Grrr…. expresses how I feel ’bout homestays at Coorg.